Secondary schools across Flanders and Brussels are being invited to take part in an innovative science project exploring how the local environment affects weather conditions. The aim is to build a network of 50 identical weather stations that will collect data on differences between town and countryside, and explore the influence of features such as dunes, forests and lakes. Most weather stations in Flanders are located in open, rural locations, which means they offer no insight into the way the local environment influences weather conditions. For example, it is already known that temperatures in the city can be considerably higher than in rural areas, because of the city’s densely packed buildings. But does this also happen in smaller towns and villages? Researchers would also like to know whether local weather conditions are affected by having sandy soils or dunes in the vicinity, or by nearby forests, lakes or industrial areas covered in concrete. With a network of identical weather stations in different settings, it should be possible to answer some of these questions. The Butterfly Project (Vlinder in Dutch, for VLaanderen IN DE weeR) has been designed by the Department of Physics and Astronomy at Ghent University, with financial support from the Flemish government’s citizen science initiative. The aim is to collect a year’s worth of comparable data on temperature, humidity, precipitation and wind strength from local environments across the region. 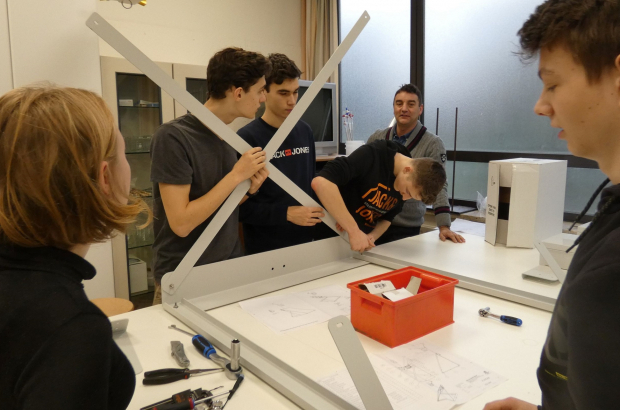 The first weather station went live on Monday at the Heilig Graf College in Turnhout. Now the researchers are looking for more secondary schools that want to participate in the project. They can apply until the end of April via the project’s website. Schools that propose a good location and are accepted into the network begin by having pupils build the solar-powered weather station themselves, from a kit supplied by the university. Pupils and teaching staff can then follow the project as it unfolds over the year, with related lesson plans in geography, physics and technology that take advantage of the station and the information it collects. “Students can get started with their own measurements, and then compare them with measurements in neighbouring weather stations,” Steven Caluwaerts of Ghent University told VRT. All the measurements will be transmitted to a central server, where they will be accessible to everyone. In addition to the researchers and members of the network, other schools, municipalities and individual citizens can work with the data. not sure what would be "innovative" about a school weather station...I set these up 10 years ago...and you can ketone cheap on Amazon...-everyone- is doing it.